The sky's the limit when it comes to our landscaping services. Whether you prefer a modern drought-tolerant design or a classic green lawn, our expert technicians will execute your project flawlessly. 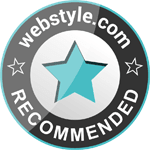 One of our most popular services, fences can be anything but ordinary. Our designers use a wide array of styles to beautifully anchor your yard. 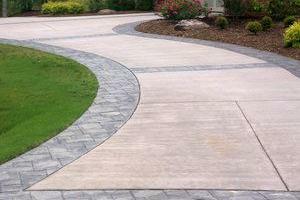 Durable, easy to maintain, slip and acid resistant; pavers make an elegant addition to any yard. Customers can also choose from the unique colors, patterns, shapes, and finishes available. 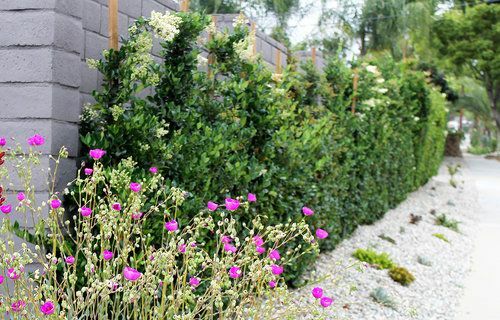 The humble hedge has lots of advantages including the look & privacy value. Plants are the base of most landscape projects. Here in LA there's a wide variety to choose from. Decomposed granite (DG) is the ideal drought-tolerant material: natural, permeable, versatile, and inexpensive. Let your creativity shine with DG paths and seating areas that are modern and unique. A garden wall is a structure that holds soil behind it. Great for hillside properties, walls can be designed in almost any style from wood to stone, concrete or brick. Whether it be a shaded walkway, passageway, or sitting area; pergolas create incredible atmosphere. Keep yours simple and modern or train some vines to climb the pillars for classic mystery. Here in Los Angeles, water-conservation is an ever-present concern. As such, our designers have become masters at choosing from the endless varieties of succulents for vibrant, personal landscape designs. 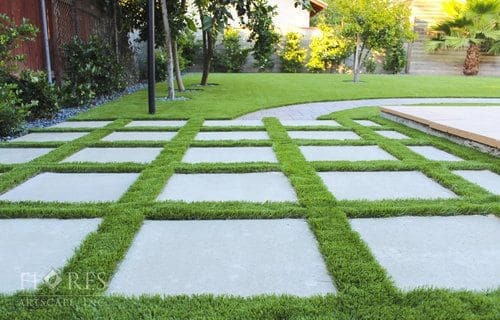 Have a grass-free patio or lot that could use some life? We will install and arrange a planter box of any size or style. Check out some of ours for ideas. For those that prefer this time-honored staple, there are many options available. Not only do we install top-quality artificial turf, but also the most popular grass types & irrigation. Due to their infinite colors and shapes, your creative possibilities are endless. Our representatives will work with you to make your yard unique, as was done with the "Crystal River" above. Ranging from classic to ultra-modern—fountains create an aura of tranquility. Looking to do a little yoga in the back-yard? This option may be for you. Barbecues, parties, food, friends and family. Enough said. From Pavingstone to concrete, we'll construct your patio to your exact taste, wherever you want it. Thousands of LA homes are nestled in the hills throughout the city. As such, we have taken on hundreds of projects involving the delicate procedure of installing stairs to properties. We will ensure yours are perfect. A truly unsung hero of property value, your driveway can create a huge impact on the curb-appeal of your home. Simply need a bigger driveway? Our technicians specialize in driveway-widening and will take care of every step. Flagstones have a variety of colors and uses making them perfect for patios, walkways and more. They fit into almost any landscape style. Drought-tolerant & low-maintenance landscapes are two ways of saving water and maintenance time & cost without sacrificing beauty.